Listen to Pamela Olson's conversation with Suzette Grillot and Joshua Landis. When I tried to describe the things I had seen in Israel and Palestine, people in the U.S. tended to assume I was exaggerating, because it didn't match at all with what they were used to hearing on the news. I decided to write something that started from zero and told an engaging story, so that people would "hear me out" while I painted the full picture. I hope it can help spark a more honest discussion here in the U.S. about the part we play in this conflict. Olson says that her first encounter with Palestinians in the West Bank was nothing like she expected. “People were so kind,” Olson says. “They asked me where I was from, and I said Oklahoma. And they said ‘Oh, Oklahoma! It's a dangerous place.’ And I was like, ‘What have you heard about us?’ And they said, ‘Wasn't there a bombing?’ And I was like, ‘Well, yeah, there was one bombing almost 10 years ago.’ Like, I don't know. We're in occupied Palestine and this guy's worried about Oklahoma being dangerous? It struck me as really bizarre, but, you know, if you knew nothing about a place except whatever building blew up, then that colors your perception of that place. So it was very humbling in that sense and also in the sense that at first I was hesitant to tell people that I was American because I had been told that they hate you for whatever reason. And everyone was like, ‘No, no, no, we understand. We don't like your government, but you're an individual. You're coming here to see for yourself. We really appreciate this.’"
This is not what Olson experienced. 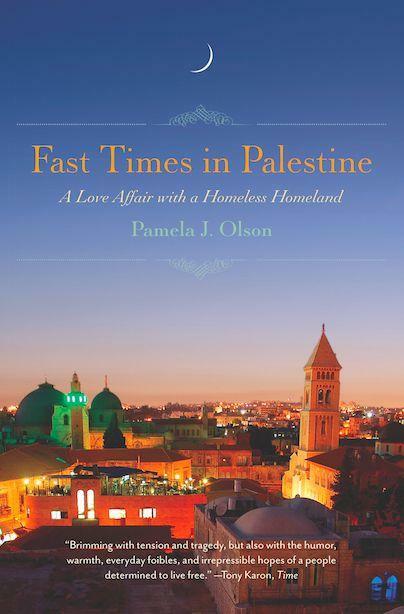 During her time in the West Bank, Olson participated in the olive harvest, celebrated Ramadan, made friends with Palestinians and Israelis, and immersed herself in the local media industry. She quickly started to see inconsistencies in stories focused on the Israeli-Palestinian conflict. Olson says that often the media simply gets stories about the Palestinian Territories wrong. “We'd be in Palestine watching something happen, and then we'd go home, turn on CNN, and watch the coverage of that thing and be like ‘What are they talking about? This has nothing to do with what we just witnessed,’" Olson says. Olson says most Palestinians don't have much hope for any talks brokered by the U.S.
“The thrust of every peace process before has been talk, talk, talk, expand the settlements, nothing happens, blame the Palestinians – they’ve already have seen this movie, and they're not really hopeful about a different ending this time,” Olson says. Hope, Olson says, comes from recognizing the humanity – and reality – of both sides. That's another element of the common American narrative, that the Palestinians never miss an opportunity to miss an opportunity. It's actually much more complicated than that. The Palestinians since 1988, the Palestinian Authority, has recognized Israel as a state. And the entire Arab World, in fact, in 2002 agreed to recognize Israel in exchange for peace based on international law, based on 1967 borders, based on a shared Jerusalem for a capital, you know, Israeli west Jerusalem and Palestinian east Jerusalem, and acknowledging the rights of Palestinian refugees. These aren't based on particular Palestinian prejudices; these are based on international law. And so far, actually, in fact, it's Israel who's rejected that formulation of it because, essentially, for now, for them, the occupation is... I mean, they're able to, with relatively little cost, maintain these cities they've built in the West Bank illegally, illegal settlements, and extract water from the West Bank, and use it for however they like, and sell part of it back to the Palestinians for an inflated price. And because the U.S. holds veto power in the U.N. and is allied with Israel, we essentially allow them to get away with these violations of international law. So as long as there's no cost to them for maintaining the occupation, they're probably going to maintain it. And as long as the U.S. has this policy of Israel right or wrong, I don't see anything good happening in that region as far as moves toward peace. The reality, I found, is Palestinians don't really have an army, and they've lived on the land for many centuries before there was a state called Israel. And you can argue about the founding of the state of Israel, but the fact was 750,000 Palestinians were driven out of their homes and land and in the West Bank and Gaza four million people now live under total military occupation where they don't have rights to vote in Israel although Israel controls their lives. And they don't have access to a civilian court system. The Israeli military court has jurisdiction over them, and it has something like a 99 percent conviction rate. By the time I got to Amman, Jordan it was the fall of 2003, and the Iraq war was six months old. And, you know, I had been told from the news back home that the Iraq War is more or less under control, it's fine, it's going to be over soon, whatever. And I stayed in a hotel where journalists were staying, and foreign aid workers, and they were saying "No, it's not fine. It's bloody chaos. It's getting worse. It's going to be years and years. It's probably heading toward civil war." Of course, it turned out they were right, but at the time I didn't know who to believe. Then I met a couple of guys who were doing work in the West Bank. And we became friends, we traveled together a little bit, and they told their stories from the West Bank, and this was also kind of a bad year for the Second Intifada. And their stories were similarly just totally opposite-world from what you hear, what sort of the basic understanding of Israel/Palestine is in the U.S. And more or less just to call their bluff, I followed them in and went to the West Bank with them. And sure enough, everything they had said had actually been toned down for my consumption. It was actually much more extreme than what they were saying. SUZETTE GRILLOT, HOST: Pamela Olson, welcome to World Views. GRILLOT: So, tell us about what took you to Palestine. You wrote a book about it, and we'll get into the book. But what even took you there to begin with? OLSON: So, it started... so I studied physics in college, and I loved physics, I still do. But I started to realize that even physics is actually political, because, you know, who's applying for the grants, who's giving the grants, what are the policies that are putting this technology versus that technology in place in the U.S. because I was interested in alternative energy. So I started studying politics as well, and then I studied abroad in Moscow for a semester, and I just found that learning a Russian phrase in the morning and using it in the afternoon and, you know, learning about the conflict in Chechnya from Chechen refugees and mothers of soldiers and then, later, when I took the train across Siberia, from the soldiers themselves was a lot more engaging to me than sitting in a dimly-lit basement laboratory watching numbers tick on a machine. So, when I graduated I started thinking about how I could do more of this travel and learning languages and the things I really loved doing. And it happened to be right after 9/11 and right as the Iraq War was getting started in 2003. At the time, I was dating a Lebanese guy, and the way he talked about Lebanon was like it was Club Med or something, like "the beaches are beautiful and the women are gorgeous and the food is amazing and the mountains and this and that." And then on the news you hear, "Oh, it's a vast desert full of caves and Kalashnikovs and misogynistic bearded maniacs who want to kill you for your freedom." So there was a little bit of a cognitive dissonance going on and I wanted to check it out for myself. So I ended up meeting a friend in Egypt, and we just did touristy things in Egypt for a few weeks, and that was plenty adventurous enough for me. And then he left, and then by the time I got to Amman, Jordan it was the fall of 2003, and the Iraq war was six months old. And, you know, I had been told from the news back home that the Iraq War is more or less under control, it's fine, it's going to be over soon, whatever. And I stayed in a hotel where journalists were staying, and foreign aid workers, and they were saying "No, it's not fine. It's bloody chaos. It's getting worse. It's going to be years and years. It's probably heading toward civil war." Of course, it turned out they were right, but at the time I didn't know who to believe. And I thought about visiting Baghdad and seeing it for myself, and then I got talked out of it. Some journalists were like, "Look, kid, you're not ready for what you would see in Baghdad right now." Then I met a couple of guys who were doing work in the West Bank. And we became friends, we traveled together a little bit, and they told their stories from the West Bank, and this was also kind of a bad year for the Second Intifada. And their stories were similarly just totally opposite-world from what you hear, what sort of the basic understanding of Israel/Palestine is in the U.S. And more or less just to call their bluff, I followed them in and went to the West Bank with them. And sure enough, everything they had said had actually been toned down for my consumption. It was actually much more extreme than what they were saying. GRILLOT: And you decided to stay. So you end up in the West Bank, you know, just kind of on a whim, it sounds like. But you decided to stay. Why? OLSON: You know, of course I was intimidated. I was worried because this was the first conflict zone I had ever been in, but just immediately I was made to feel so welcome. And people were so kind. They asked me where I was from, and I said Oklahoma. And they said "Oh, Oklahoma! It's a dangerous place." And I was like, "What have you heard about us?" And they said, "Wasn't there a bombing?" And I was like, "Well, yeah, there was one bombing almost 10 years ago." Like, I don't know. We're in occupied Palestine and this guy's worried about Oklahoma being dangerous? It struck me as really bizarre, but also as, you know, if you knew nothing about a place except whatever building blew up, then that colors your perception of that place. So it was very humbling in that sense and also in the sense that at first I was hesitant to tell people that I was American because I had been told that they hate you for whatever reason. And everyone was like, "No, no, no, we understand. We don't like your government, but you're an individual. You're coming here to see for yourself. We really appreciate this." And just in a million ways people were so welcoming. I met a guy who spoke Russian, a Palestinian guy who spoke Russian, and, of course, I had studied in Russia. So we had our own secret language together, and we started having a little, I guess, flirtation at first and then it kind of went from there. And also, the olive harvest was right around this time, and that was such an incredibly fun experience. The kids running around, and the olives all falling from the trees and onto the tarps, and it's like this olive rain. And you know at the end of it you're going to get an RC Cola bottle full of very fresh, ripe olive oil. And it was Ramadan. It was like the perfect storm. Like the perfect time to be there. And, you know, during Ramadan you think it's going to be "Oh, everyone's fasting and depressed and this and that." But in fact it's like, in my case, it's kind of like watching music videos all day and then feasting and partying all night. And every night I had at least five invitations to different people's homes. So I got to know the whole village, and people were so kind. And so all of that together, plus the complete insanity of the situation and trying to understand it, really sort of hooked me and pulled me in. LANDIS: So, I have to ask, what's the difference between the narratives, or between the reality that you saw and the narrative that you imagined, that you had learned, in the United States? OLSON: Sure. So, the narrative you learn in the U.S. is, basically, there's a country called Israel, and then there're these people called the Palestinians, and they both sort of want the same land, and they both sort of have sort of armies, and they both have casualties. And Israelis are pretty much like us, you know, they look white and they speak English and this and that. And the Palestinians are sort of not like us. They're sort of angry, and they're bearded and they're strange and they don't speak our language and all this kind of stuff. And also you think of the West Bank, or the Palestinian areas, as being just these demolished, rubble-strewn wastelands, and just full of, like, angry strange people. But the reality, I found, is Palestinians don't really have an army, and they've lived on the land for many centuries before there was a state called Israel. And you can argue about the founding of the state of Israel, but the fact was 750,000 Palestinians were driven out of their homes and land and in the West Bank and Gaza four million people now live under total military occupation where they don't have rights to vote in Israel although Israel controls their lives. And they don't have access to a civilian court system. The Israeli military court has jurisdiction over them, and it has something like a 99 percent conviction rate. And then the systematic violence against Palestinians. There would often be something like, "Oh, a Palestinian attack shattered a six-month lull in the violence." And that would be like the headline in the U.S. And sort of maybe "14 Israelis were killed in an attack by Palestinians." And then you look at the past six months, and you'd see that 300 Palestinians were killed and zero Israelis were killed. So, a "lull in the violence" in the U.S. media just means no Israelis were killed. It doesn't mean no Palestinians were killed. But the Palestinians, the everyday brutality against them, it doesn't make headlines as much as the spectacular few, relatively few, attacks by the Palestinians. LANDIS: But haven't Palestinians been given many opportunities for peace, for compromise? They reject them each time. What choice has there been for a real solution? OLSON: That's another element of the common American narrative, that the Palestinians never miss an opportunity to miss an opportunity. It's actually much more complicated than that. The Palestinians since 1988, the Palestinian Authority, has recognized Israel as a state. And the entire Arab World, in fact, in 2002 agreed to recognize Israel in exchange for peace based on international law, based on 1967 borders, based on a shared Jerusalem for a capital, you know, Israeli west Jerusalem and Palestinian east Jerusalem, and acknowledging the rights of Palestinian refugees. These aren't based on particular Palestinian prejudices; these are based on international law. And so far, actually, in fact, it's Israel who's rejected that formulation of it because, essentially, for now, for them, the occupation is... I mean, they're able to, with relatively little cost, maintain these cities they've built in the West Bank illegally, illegal settlements, and extract water from the West Bank, and use it for however they like, and sell part of it back to the Palestinians for an inflated price. And because the U.S. holds veto power in the U.N. and is allied with Israel, we essentially allow them to get away with these violations of international law. So as long as there's no cost to them for maintaining the occupation, they're probably going to maintain it. And as long as the U.S. has this policy of Israel right or wrong, I don't see anything good happening in that region as far as moves toward peace. GRILLOT: So your book Fast Times in Palestine. What do you mean by "fast times"? OLSON: You know, when I first stumbled into the West Bank, as I mentioned, it was this perfect storm of all these things going on: all these things I'm learning, all these people I'm meeting, it was very overwhelming. I liken it to a machine gun barrage of things that I'm learning and seeing and impressions and that kind of thing. And then I moved to Ramallah, the big city, to volunteer with a progressive political leader. And just as I'm getting settled into that whole thing, because there's a big learning curve of course, then I was offered a job as head writer and editor of the Palestine Monitor. And I was like, "Are you sure you have the right number? You know, I'm a physics major, ex-bartender, volunteer from Oklahoma. I'm not sure you want me to be running an entire news organization." But they're like, "Oh, you'll figure it out." So, I kind of spent three months just cramming all this knowledge into my head about how to be a journalist, and about all of these terminologies, and the trends, and learning how to report on each death. Every morning I woke up, and it was like "Who had died the night before?" And just when I was kind of getting into the groove with that, then Yasser Arafat died and my boss decides to run for president of the Palestinian Authority. And because all of the other foreigners would be going to England or Spain or Australia for the Christmas holidays, I was the only native English speaker left. So kind of by default I became his foreign press coordinator. So that was the most intense two month of my life, that sort of presidential campaign when I'm doing my full-time job and doing the full-time job of being his foreign press coordinator. And when that finally died down, I don't know, it was like different people came to visit, and my parents came for a visit. I had to show them around, and then I needed a new visa, and it was just like... it was really probably the most intense year and half that I hope to have in my life. GRILLOT: So it's about the intensity of the situation. It's not only personally, but politically, socially, in every respect in this part of the world, it's so intense, right? GRILLOT: So what's going to get them out of this situation? What is going to help them reduce that intensity? OLSON: I don't see very much hope, and most Palestinians don't see much hope, from the so-called peace process that the U.S. is supposedly trying to resurrect. The thrust of every peace process before has been talk, talk, talk, expand the settlements, nothing happens, blame the Palestinians. Like, that's how it always tends to go. So they kind of already have seen this movie, and they're not really hopeful about a different ending this time. What can they do? I mean, for one thing there's a massive movement of non-violent resistance in Palestine that just recently was featured in the New York Times Magazine, finally, after years of being ignored. It's finally starting to be recognized and mentioned in main-stream U.S. news sources. And the article is called "Will the Third Intifada Start Here?" and it's online and well-worth the read. So, definitely that is helping, little by little, to change American public opinion. You know, I hope my book can also help, or at least allow people to engage with the conflict from a more realistic perspective, as opposed to the narrative we get here. It's not very realistic. It's not very closely aligned with actual reality. We would actually very often... We'd be in Palestine watching something happen, and then we'd go home, turn on CNN, and watch the coverage of that thing and be like "What are they talking about? This has nothing to do with what we just witnessed." Or they missed the point, or they missed the larger story and just focused on one small thing. So I'm hoping that, at least in this one arena where there's still a democracy of ideas more and more because of blogs and Palestinian writers and movies like Five Broken Cameras and hopefully books like mine, that at least in that sense we can start changing American public opinion and maybe eventually have an impact on U.S. foreign policy. LANDIS: You've been taking your book across the country. What's the reception been like? What do your parents think of all this? What do Oklahomans think about when you bring this talk to Oklahoma? OLSON: Well, this is my first day speaking in Oklahoma, and so far it's been great here, but it's probably sort of a self-selected crowd. All over the country so far, it has been surprisingly receptive. I was kind of waiting for some sort of backlash or dissension, but so far it's been, again, probably self-selected crowds, but still. People have been very respectful, very open. As for my parents, they actually came and visited me in Israel/Palestine. And, spoiler alert, we had a wonderful time. But they were also very shocked by a lot of things they saw. LANDIS: They weren't frightened to go there? OLSON: They were, but I had to essentially emotionally blackmail them and say like "If you love me, you'll come and see what my life is like over here." I think they were more afraid of that. GRILLOT: Alright. So, very quickly, are you headed back? OLSON: Not anytime soon. I usually go back about every two years, but I'm getting married this year and then there's going to be a move next year, and so I'm not sure exactly when it's going to happen next. But it's always, it's like a second home and I always miss it. LANDIS: Congratulations on your marriage. 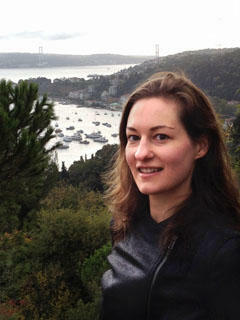 GRILLOT: Well, thank you so much, Pamela Olson, for joining us on World Views. OLSON: My pleasure, thanks so much.